Someone said that many years ago, and even though we are not entirely sure what it means, we don’t want you to be verbless. 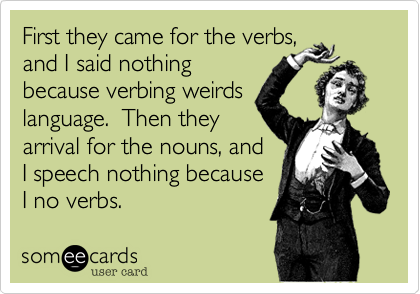 So this week our objective is to make verbs the subject of discussion. From Old English forswerian, from for- (away, off) + swerian (to swear). Ultimately from the Indo-European root swer- (to speak), which also gave us the word answer. Earliest documented use: before 1000. Christine Merrill; Lady Drusilla’s Road to Ruin; Harlequin; 2011. See more usage examples of forswear in Vocabulary.com’s dictionary.